What can I use in my bigshot? Well I have been slack and not posted for a while but I have been “playing” with my bigshot. Given that I am only using embossing folders as I have already invested in a cricut my quest has been to work out what scraps of paper, card and other items I can actually use in the bigshot. Foil cardboard – the kind you buy the kids to make stuff out of embosses fantastically, very clear & precise and as a bonus readily available and cheap! Stardream/Opal papers – embossed fantastically, clear image. 2 pieces seem to emboss the same as 1. 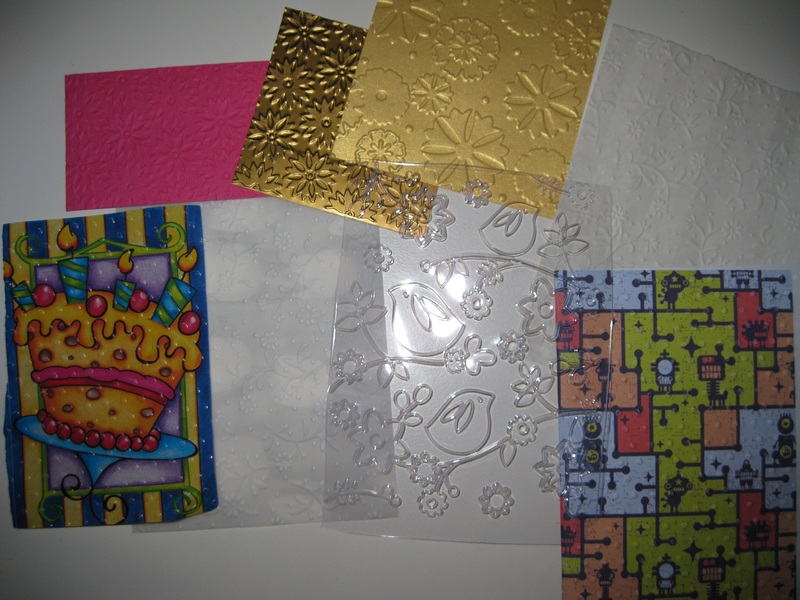 Acetate/clear packaging (including from your embossing folders!) – embossed fantastically, nice deep images which are clear. So don’t throw away that clear packaging cut it up and use it. Vellum – plain and printed work great, gives a nice embossed finish but not clear images. You need to use at least 2 pieces at one time. All of these are pictured below. Top row from left – bazzil, foil board, stardream, wallpaper. Bottom row from left – wrapping paper, vellum, clear packaging, printed paper. My girlfriend tested alfoil – you need to double up twice, it will crease-up a little around the embossed image so don’t expect a pristine flat piece of alfoil. Brown paper also works well. Other household items yet to be tested but I expect will be great – cereal boxes and covers from magazines. The addition of “embossing” really does make an otherwise ordinary looking item look fantastic whilst being good for the crafting budget and the environment. I would love to hear any other idea’s for what to emboss.